Through a new global partnership with SOS Children’s Villages, the Radisson Hotel Group aims to have its 1,400 hotels support more than 1,100 children and help establish meaningful local relationships with SOS Children’s Villages worldwide. Corporate partners play an important role in supporting our work for children and families in vulnerable circumstances. Our exciting new partnership with the Radisson Hotel Group, launched in April 2018, focuses on the shared theme of hospitality, as aligned with SOS Children’s Villages’ mission and Radisson Hotel Group’s aim to provide food, shelter and better futures to children. In countries around the world, SOS Children’s Villages and the Radisson Hotel Group aim to engage in meaningful local relationships that will benefit children, families and communities. “Responsible Business is at the heart of our company’s promise of making every moment matter, which also means that we support and help advance the communities in which we operate,” says Federico J. González, President & CEO, Radisson Hospitality AB and Chairman of the Radisson Hotel Group Global Steering Committee. Through the partnership, each Radisson Hotel Group hotel has committed to support children from all around the world and in addition, they will help to mobilise local supporters and volunteers to support us in our goal of ensuring that no child grows up alone. Additionally, hotel guests will be invited to engage as well. 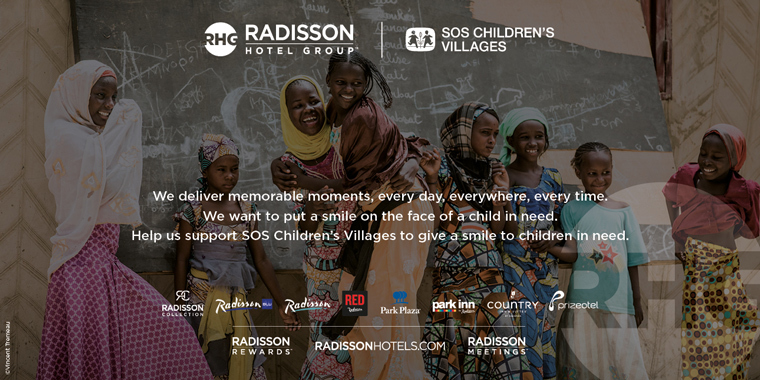 By connecting the partnership to Radisson Rewards, the group’s loyalty program, members can redeem points for donations towards SOS Children’s Villages. Moving forward, this global partnership will translate into locally relevant collaborations. They will be shaped in each country to best reflect the local context and local needs. “Currently our colleagues all over the world are exploring together with Radisson Hotel Group teams how we can best join forces at a local level, so that we can reach the greatest impact for children and families in local communities,” Ms Molano says.